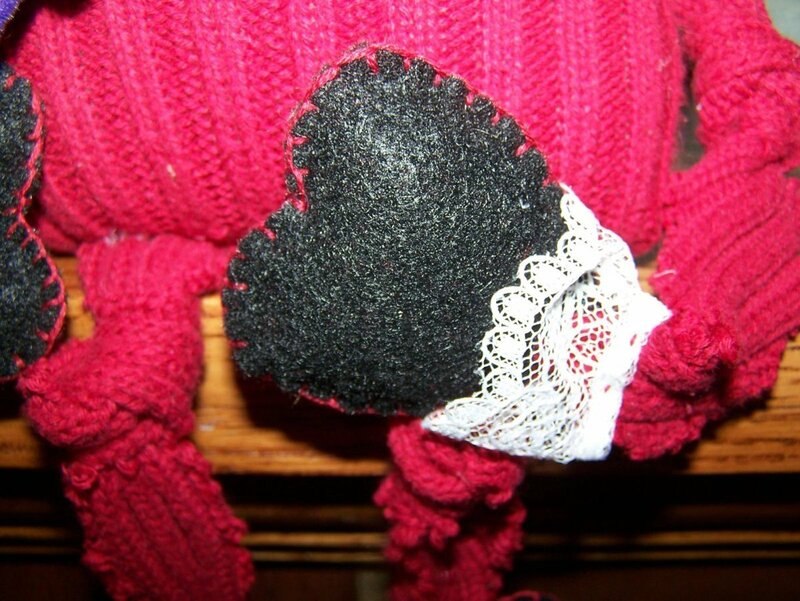 All 12 inches of Mopheart is packed with love waiting for you to make another of her kind. She is lonely and really wants to know she won't be the last of her race in this world. 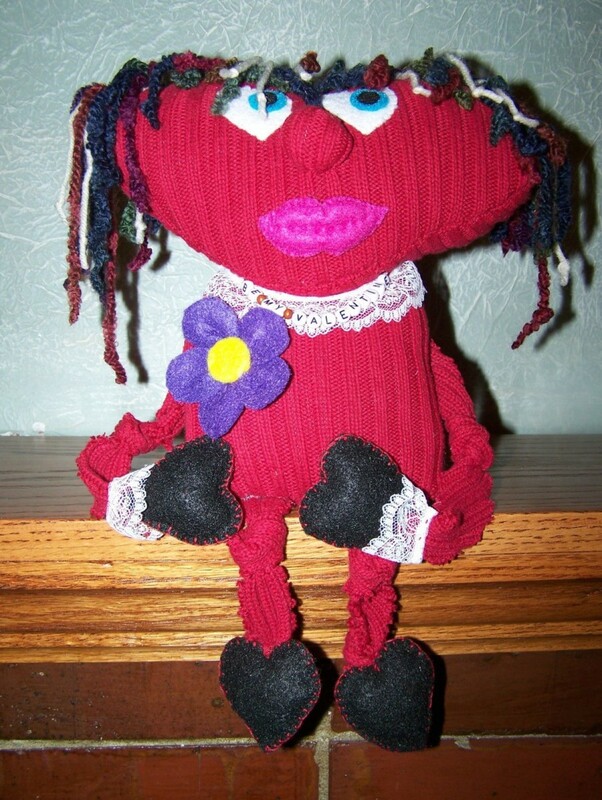 If you have some old sweaters, yarn, and felt scraps you can whip her out in an afternoon easily. 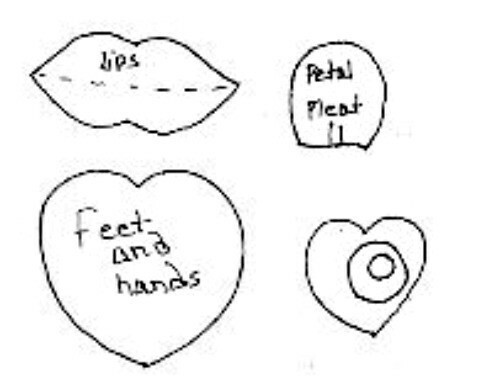 Enlarge the pattern and have fun making more Mophearts for the Valentines in your world. You could make the character from any color he is so cuddly and loveable and as you can see he/she really needs some good old loving. Cut two hearts approximately 10 inches wide by 6 inches high. For the body, cut two squares 6 x 6 inches. The eyes, nose, feet, and hands picture can be enlarged for a pattern by clicking on it. You can also draw your own. Cut hearts about 2 inches for the eyes. Cut a 2 inch circle for the nose from the sweater material. 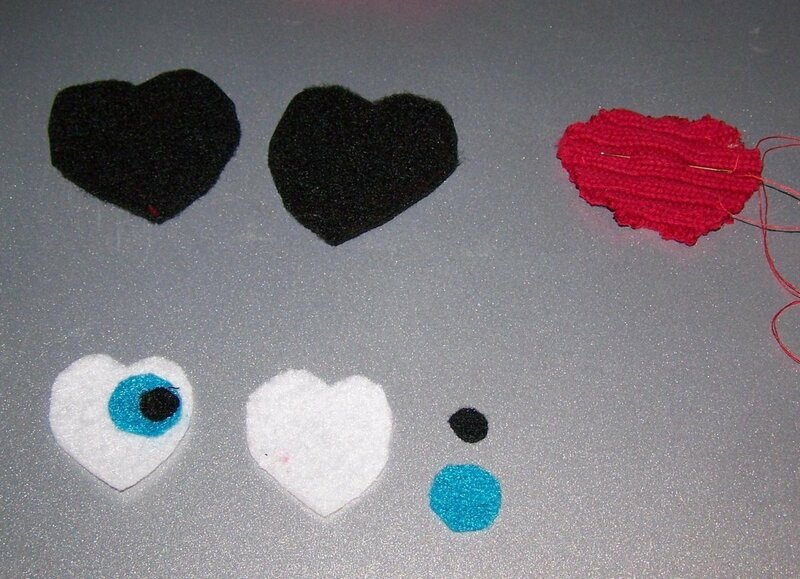 From your felt scraps cut (two of each), 3/4 inch circle from white for the eyes, 3/4 inch circle in blue or your choice of color, and 1/4 inch black circle for the eyes and you have it. You might want to sew your features on before you sew the two layers together, that is up to you. Sew the heart head leaving a 2 inch opening, turn right side out, stuff (if you want her to sit up) add some rice or beans before you sew shut. If you waited now is the time to sew the features on. For the heart eyes I did an overcast around the edges. 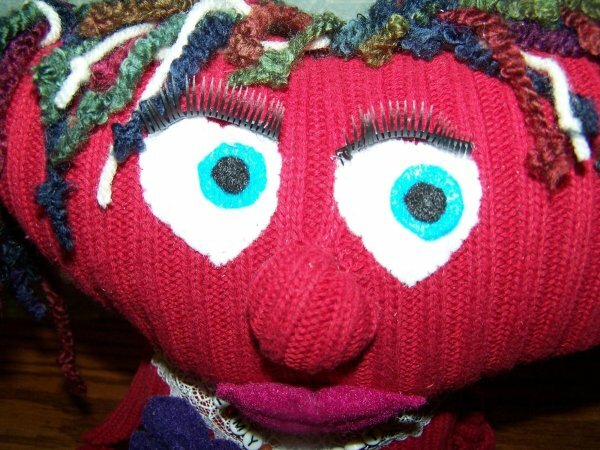 Gather a 2 inch circle of fabric for the nose, stuff, and add to the face. 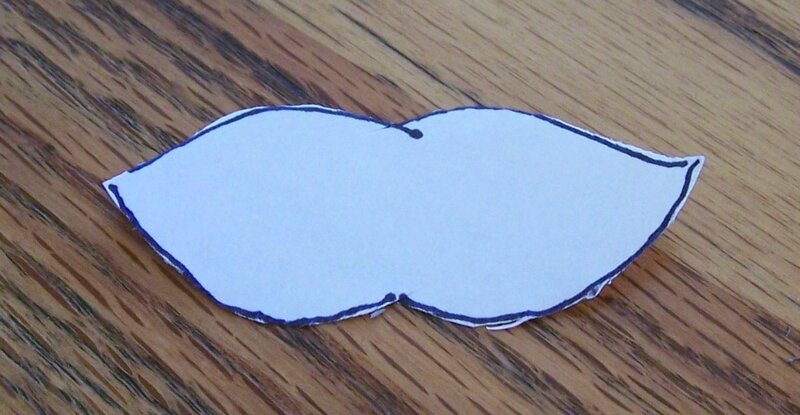 Cut out two of the lips pattern and overcast the edges together leaving a space to stuff them, then close the opening. 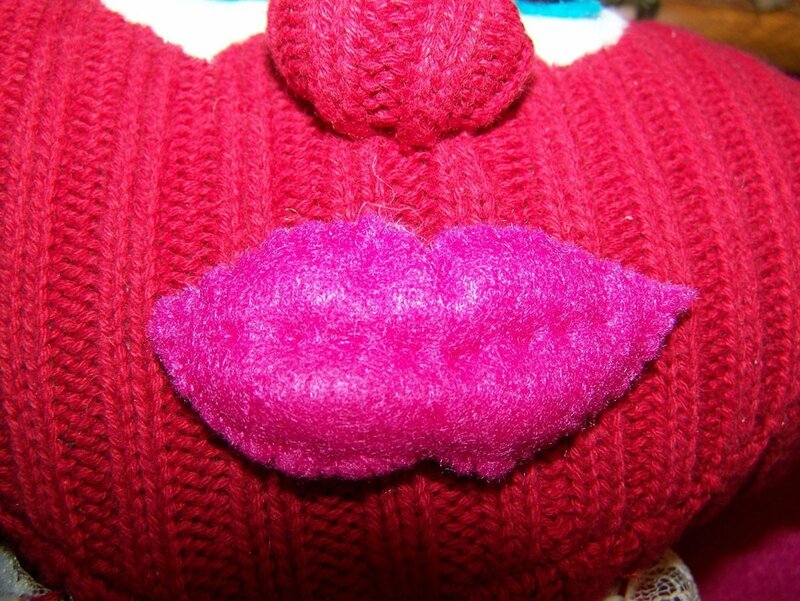 Stitch a seam through the lips from one end to the other to separate the the lips. Stitch or glue them on just under the nose. Make the feet and hands in the same matter. 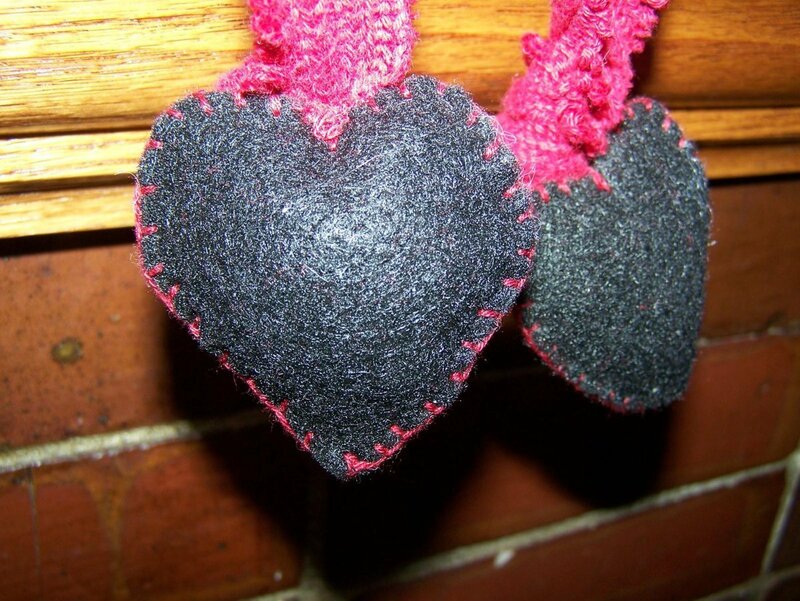 I did a blanket stitch of sorts on them; that is the only difference. 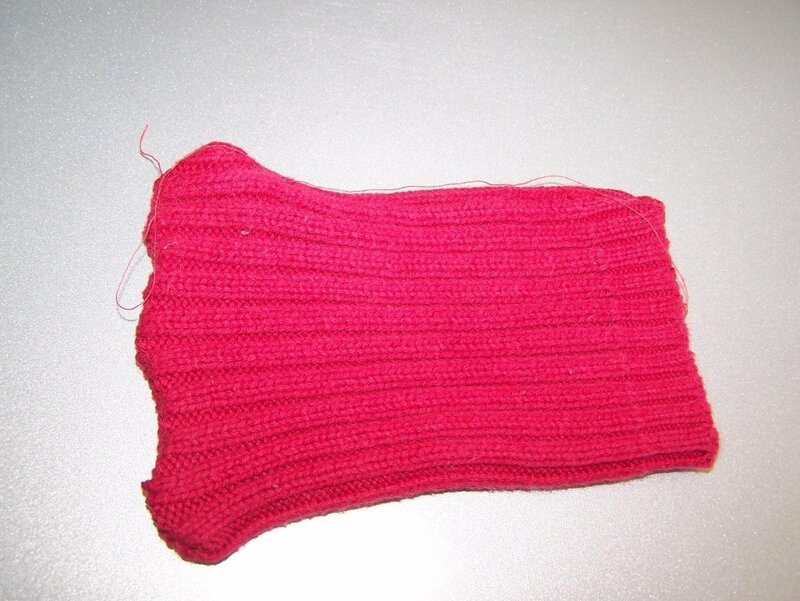 Cut 4 strips 9 inches long from the sweater material for the legs and arms. Make a knot in the center for the arms. For the legs make a knot in one end and the center. Do the end one first so you know where the center will be. Stitch the plain end to the bottom of the body. Add a heart-foot to the knots on the end of the legs as shown in the photo. I pointed the hearts away from the arms and toward the legs. Repeat with the hands and add a strip of lace around the joint. Add a strip of lace around her neck. I strung name beads that spell "Be My Valentine" and tied them around her neck. The flower is yellow felt glued around to the back of a button then 5 petals made by tracing around the first joint of your thumb (unless you have a small thumb). They are a little over an inch across and an inch long. Make a pleat in the straight edge (joint end) and glue to the back of the covered button. When you have all 5 glued on glue the flower on her chest. Her hair is made up of 9 bunches of 6 strands of multi-colored, thick yarn including one tan one. Cut 8 inch lengths and tie into a knot in the middle. Make one bunch shorter, that will be in the middle of the face or just trim it down after you get the knot made in the bunch. Tie a knot in the ends of each strand. 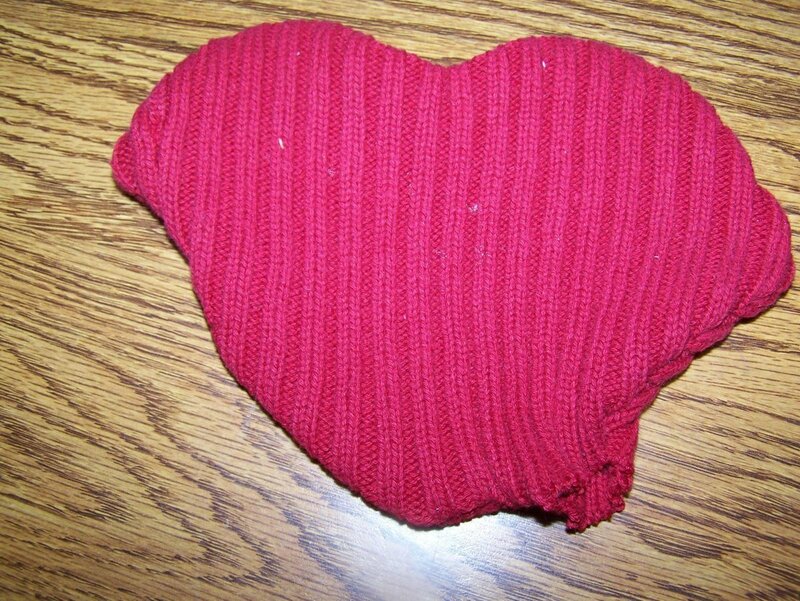 Glue them just in front of the seam across the top of the heart-head. Either stitch or hot glue the head in the center of the body. Add the arms and legs. She is really cute! I know some child will just love her! I know I would have when I was small. Great idea and instructions. Very creative!